Last week was a difficult one for many Americans, and particularly those close to music legend Aretha Franklin and senate icon John McCain. The media was more consumed with funerals than at any other time in recent memory. And, sadly, the services for these deceased notables were exploited for political gain by media cretins like Fox News who seem to have forgotten how to show respect for the families of the fallen. 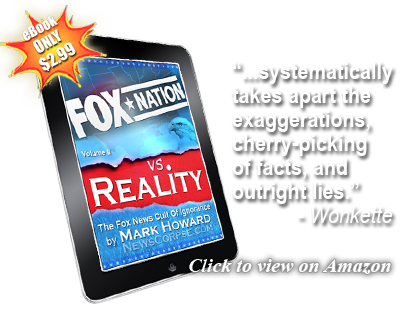 However, the passage of time over the weekend did nothing to temper the madness at Fox News. They must be getting pretty desperate for disparaging material to throw at their political enemies, because the latest assault really scrapes the bottom of the barrel. In a segment on Fox and Friends (video below), the “Curvy Couch” potatoes served up a story that criticized President Bill Clinton for his attendance at Aretha Franklin’s funeral. The objection they had was that he was seated near Minister Louis Farrakhan of the Nation of Islam. Farrakhan is unarguably a repugnant bigot who has been inciting racial and religious hatred for decades. It was surprising to see him at the service for a woman known for her support of civil rights and her closeness to Rev. Martin Luther King Jr. But for Fox News to make an issue of the seating arrangements is ludicrous. The intro to the segment had co-host Ed Henry saying that “The very controversial Nation of Islam leader who has notoriously declared that ‘Jews are my enemy’ and ‘white folks are going down,’ was seated prominently alongside former President Bill Clinton.” In fact, there were several references to Clinton sitting next to Farrakhan. But that’s a lie. Al Sharpton and Jesse Jackson were separating Clinton from Farrakhan. 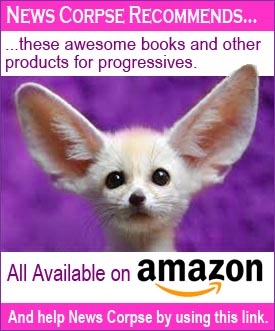 Of course, the reason the press isn’t blinking is because, in fact, it isn’t a story to anyone but the craven loons at Fox News who are grasping at straws to denigrate Clinton and any other Democrat that they happen to bump into. They previously faulted Clinton for looking in the direction of Ariana Grande when she was singing. Which is something that humans do while entertainers are performing. They also complained bitterly about the eulogies at both funerals when they thought expressions of unity, civility, and respect were attacks on Donald Trump. Now why do you suppose they thought that? Perhaps because he is anathema to those honorable personality traits? It’s noteworthy that while America was mourning, Trump was golfing and tweeting. Maybe he DM’d his BFF Vladimir Putin. And what’s really worse: Clinton sitting near, but not speaking to, Farrakhan, or Trump lavishing effusive praise on, and doing the bidding of the murderous dictator and enemy of America, Putin? Do not try to convince me that someone, anyone, at Faux News watched Aretha Franklin’s funeral. 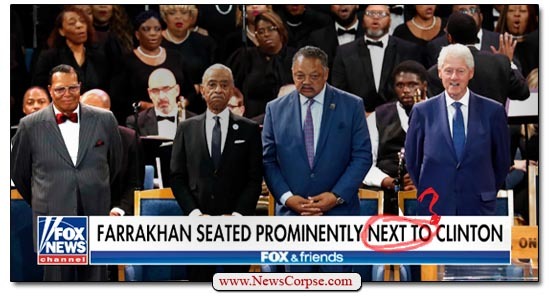 They were probably shocked when someone told them that a white person was at the funeral until they saw Farrakhan was there also and decided the white person was too close to him. The fact that it was President Clinton made no difference to them. A WHITE PERSON WAS NEAR FARRAKHAN! OMG! Small scandals for small minds. So what’s new about that from FAUX? You make good points but it is irritating that anyone bothers to answer to the scabby mud-slinging from State TV. Of course, HAD Clinton “stood up and stomped out of Franklin’s funeral after spotting Farrakhan in the crowd,” the FucksPods would be condemning Clinton for his lack of decorum. Or his lack of respect for Aretha. Maybe not that last one since, you know, she’s The Other. Or, maybe, just to be completely insane, for inviting Farrakhan AND Al Sharpton to the funeral. Which, of course, he had nothing to do with either. Anything to condemn a Democrat — and especially a Clinton. Wonder what kind of hell the FucksPods would raise if OBAMA had attended Aretha’s funeral. But of course, Obama wasn’t there because he was at John McCain’s funeral. So, another reason to condemn Obama? And, of course, Laura Ingrate was bytching about how Aretha’s funeral was “so gratuitous” and “overtly political.” Bet you didn’t hear THAT from the Ingrate about John McCain’s funeral. Of course, Clinton wasn’t there since he was at Aretha’s funeral. So, another reason to condemn Clinton? What a bunch of ret@rded a$$holes the FucksPods can be! Clinton was at both funerals. Good. I wasn’t sure he was able to attend both. Thanks.